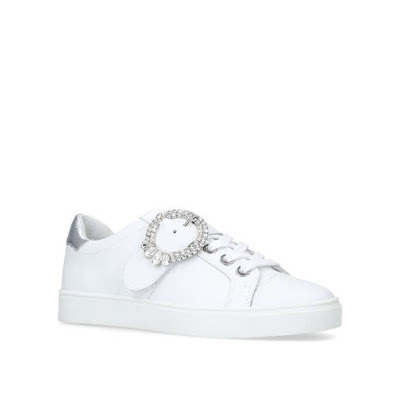 So not for the gym Kurt Geiger trainer, with embellished detailing, metallic finishes or just some fabulous diamante buckle which makes those white trainers sing …. 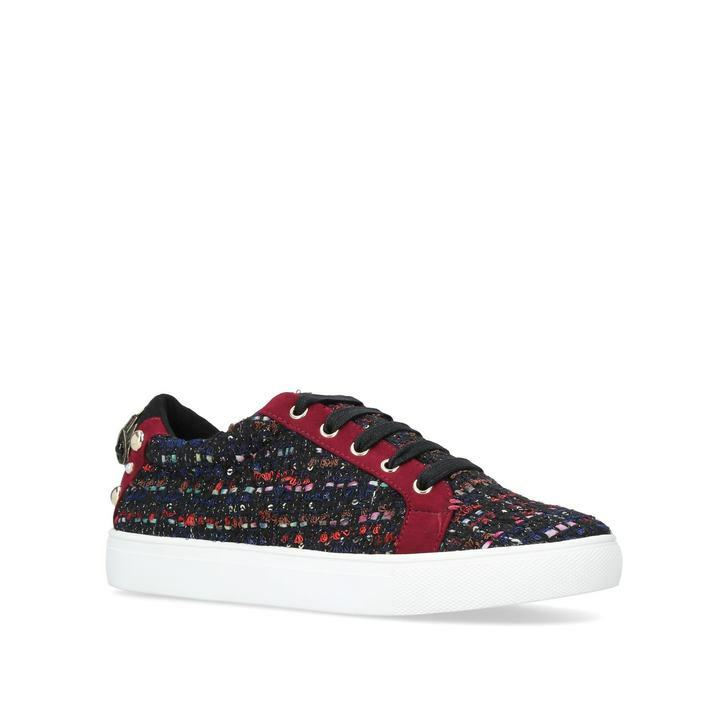 Blending chic modernity with heritage appeal, Kurt Geiger London's Linford sneaker is a masterclass in statement casuals. Neon overlays on classic tweed and a directional bandage trim lend plenty of interest to this cutting-edge low-top. 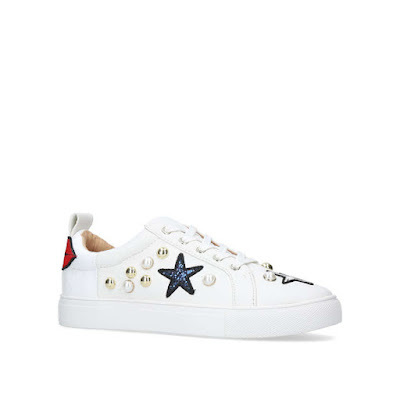 Devilishly stylish and oh-so versatile, the Ludo low-top from Kurt Geiger London arrives to add panache to pared-back looks. 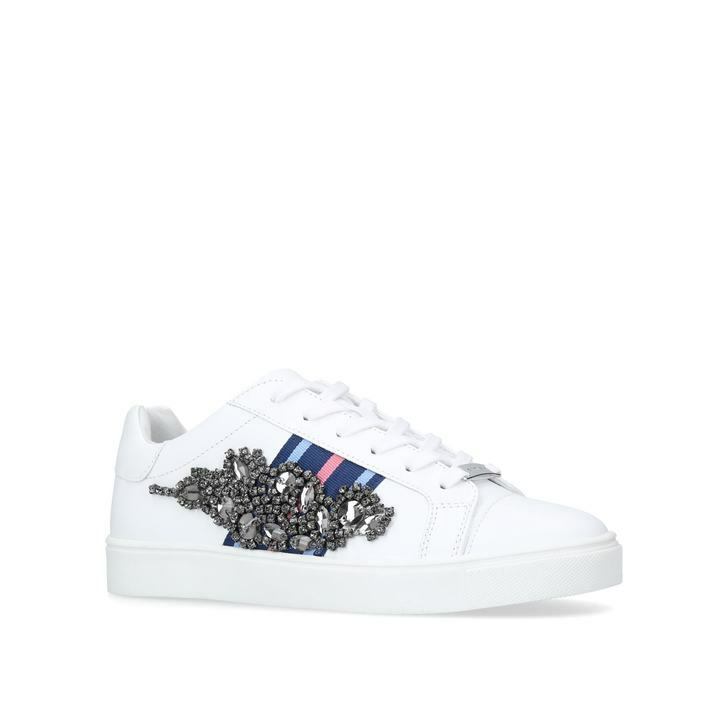 With smooth white leather uppers featuring stitched branding for a personal touch, this white sneaker is trimmed a pale pink tongue and rounded toe, and a heel with unmissable gold-tone eagle hardware with extra stud detailing. This is one to add a 'wow' to your every day. Throw out your tired low-tops and upgrade to Lippy from Miss KG. Designed to make a casual statement, this fresh design features a gold foil upper with silver foil overlays, lip and star appliqués and studwork to finish the whole package. Carvela Kurt Geiger plays with glam vs. casual in the new Lupin low-top. This simple white sneaker combines a classic lace up style with a sparkling gemstoned buckle as an additional strap and a pop of silver at the collar for a covetable clash of laid-back and luxe. Shine on in the Lustre sneaker by Carvela Kurt Geiger. Lustre is detailed with appliqued pink and blue ribbons either side of the uppers, accented by silver gemstone embellishments to the outer side. This white low-top trainer sits on a flat sole, with a lace-up fastening for a snug and secure fit. Slip off-duty feet into Luck by Carvela Kurt Geiger and watch out for envious glances. 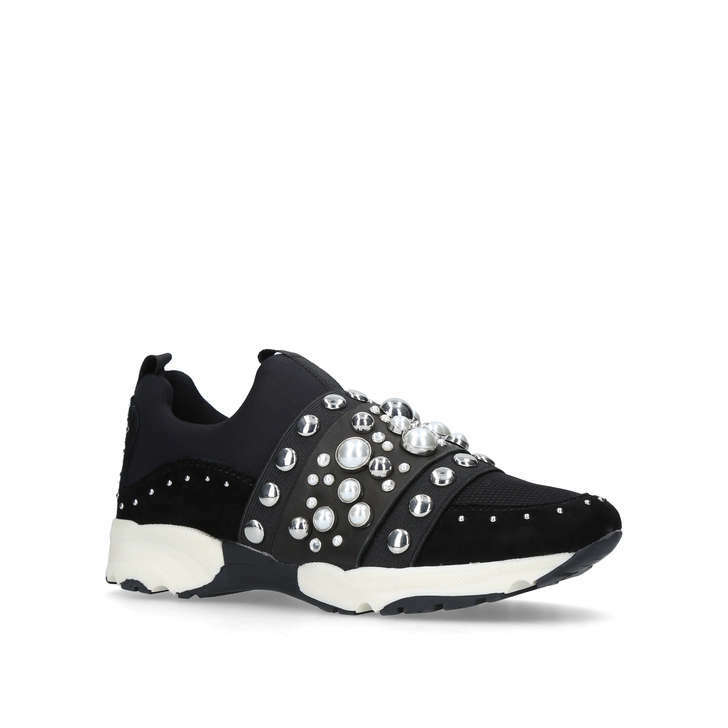 Set in black, this directional low-top trainer is dotted with oversized pearl embellishments to help keep casual looks right on point. 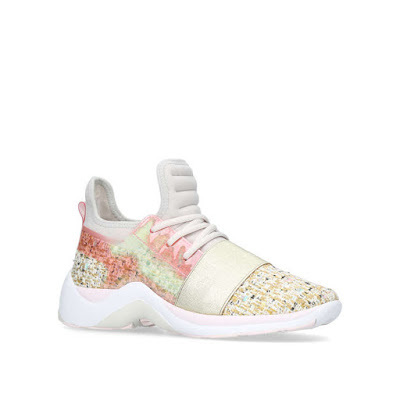 Work Carvela Kurt Geiger's new Longitude sneaker into your pared-back collection for season-ready casuals with added height. Set on a built-up monochrome sole, this black sneaker features layered uppers in gem sparkled neoprene and metallic piped suede. 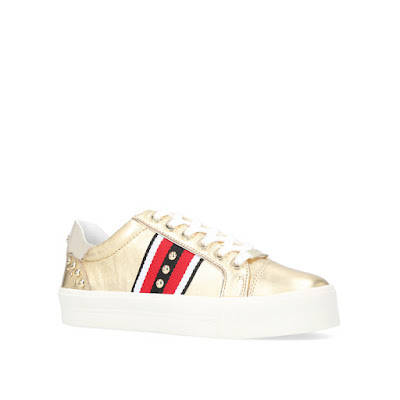 Statement sneakers don't come finer than this: Carvela Kurt Geiger's Lax lace-up bursts onto the scene in gold hues spliced with black and red stripes and gleaming metallics at the studs, eyelets and collar for luxe overtones. 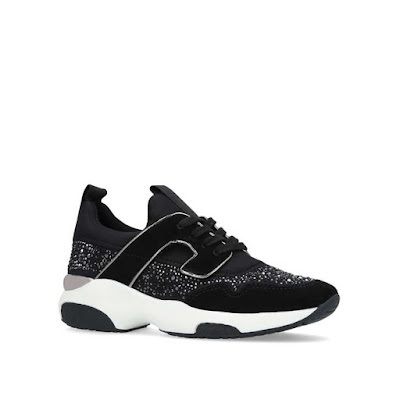 Put your best foot forward and encapsulate the current sports luxe trend with Lamar from Carvela Kurt Geiger. 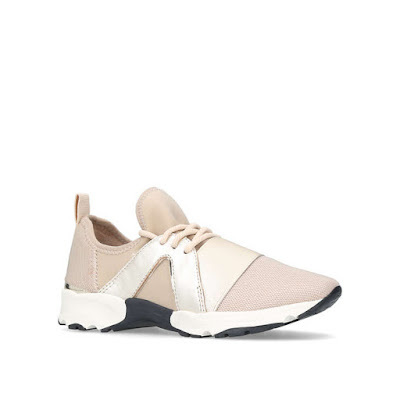 This beige lace up runner brings sporty glamour to your sneaker collection through an elasticated fit, all set upon a sturdy, supportive crisp white sole.